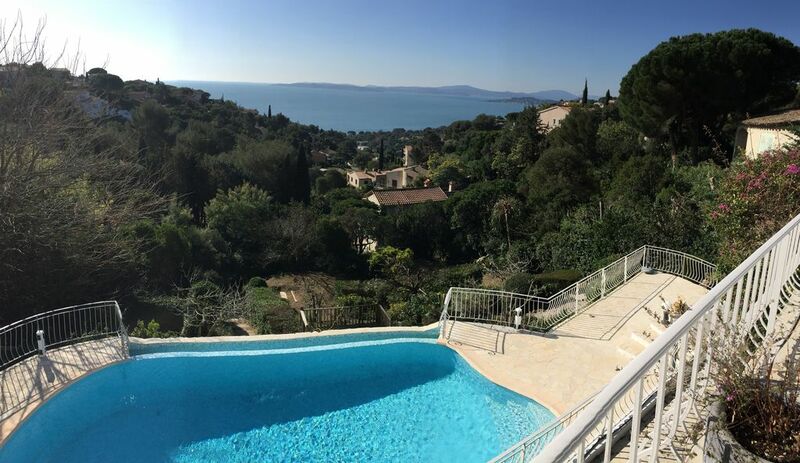 A recently fully refurbished villa overlooking the beautiful bay of St Tropez. This 4 bedroom and one studio villa [max 10 people] boasts a hilltop seat above the seaside town of les Issambres. All bedrooms have air conditioning and uninterrupted views across the sea to the village of St Tropez. Every bedroom has been individually designed and all have ensuite facilities. The kitchen and lounge areas have been designed in a very contemporary style to ensure total relaxation. These are fully air conditioned with all facilities to hand Satellite TV, WI FI , IPOD station and the newly installed kitchen has every appliance you could ever want including an and American Fridge. The lounges lead onto a beautiful outdoor eating and barbeque area which in turn leads down to the kidney shaped infinity pool . The new pool bar and outdoor kitchen means you never want to leave the pool area ! All sun loungers are of a contemporary woven loom style that compliments the whole chill out image of this villa. The beaches of Les Issambres are a 10 minute walk and St Tropez a short drive away. Please note that there is a charge for cleaning and Linen wash. This is paid locally in cash to the management team. The cleaning cost is a one off 300 euros [10 people renting] and 250 euros [8 people renting] and the linen cost is 35 euros per person . Location: The villa is approximately 20 minutes from the A8. Around Les Issambres there are the towns of St Maxime offering great weekly markets and a ferry direct to St tropez to save using the car. St Tropez has no equal with its high class shopping ,beaches and night life. In the other direction is Frejus and St Rapheal. A large town with many of the amenities everyone today are used to - large supermarkets, many garden centres, aqua parks and general shopping and many bars and clubs. Golf courses are a plenty with the the beautiful hill top villages of Ramatuel and Grimaud within striking distance. Les Issambres itself has some beautiful smaller beaches with a more intimate feel, it has a small harbour where you can hire boats and fish to your hearts content. Inland and about 40 minutes drive you have the beautiful mountain areas with unmatched walks and views and to the east the great centres of Cannes [30 mins], Nice [40 mins] and Monaco 85mins] all within easy driving distance. The villa: The villa is situated on a hill in a beautiful secluded avenue. It is high up however - hence the magnificent views so the ground has many stone steps in the garden area leading to the various terraces. Caution must therefore be taken at all times, particularly in the case of small children and the elderly. All bathrooms have been totally re furbished with the finest equipment, stone flooring and stone wash hand basins with high power showers and an abundance of hot water. The master bathroom has a beautiful stand alone bath. All bathrooms have full length mirrors with most rooms looking over the pool and sea. The villa has a large utility on the lower level that has a washing machine, one dryer, steam iron and board, drying horse, pushchair, high chair, fold down cot. Beautiful villa with a few sitting areas/terraces with views of the sea you would never tire of! Villa comprises one large master suite with 2 bathrooms, 3 small double ensuite bedrooms and a separate apartment with double bed/ensuite. The outdoor kitchen/bar is a great addition. The wild boar do exist and live at the bottom of the garden! The villa has great views - but that means its high up - the walk to the supermarket down was fine - not great going back up (steep) so car is advisable. The owners were very helpful during the booking process. I would recommend staying here. Just back from a super two weeks staying at Villa Virdaya. The villa was beautifully refurbished and Nick and Yvette should be very proud of the changes they've made. Lots of different areas to chill even with six adults. The villa is very well equipped with a kitchen upstairs and down by the pool! Plenty of sun loungers to laze on by the amazing infinity pool. We took a few of Nick's restaurant recommendations in Les Issambres and had some lovely meals. Seafood especially good. All in all a thoroughly relaxing holiday and would love to go back. Our family of 7 had the pleasure of staying at this wonderful villa recently. Upon arrival the weather was beautiful, which firstly highlighted the amazing infinity pool which sits overlooking the bay of Saint Tropez. We have spent many wonderful days enjoying this gorgeous view; you just do not tire of it. The pool and villa were spotlessly clean and there were plentiful loungers/seating for us all to enjoy and have our own space. The outside bar area is absolutely fantastic! Its even equipped with a cooker should you wish to use it. We would all relax here before venturing out on the evening for dinner in the local restaurants. We also had a couple of BBQ's which was conveniently located next to the entrance of the villa. The inside of the villa is excellent. There is everything you could ask for comfort wise, and the space has been very well thought out too. All of the rooms were very clean and tidy; the beds are very comfortable and we all slept very well during our stay. Off-road/private parking is also available where we found we could park our two hire cars easily. There is Sky TV which was perfect for our youngest when the weather got a little warm for her. This was our first holiday in a few years due to work commitments and we couldn't of been more pleased. We dined in the local town and the neighbouring towns a couple of nights which were very friendly and welcoming. There are some beautiful restaurants in the area. We spent a couple of mornings at the beach which is again very clean. The water is lovely and clear and we found the beach very comfortable for space. We would without a doubt return, though next time we would love another week instead of just one. Thank you for a truly wonderful holiday. We had the most amazing holiday in this villa. Everything was just perfect and the villa, recently renovated is stunning. The owner was really helpful whenever we had a question. We where totally 7 people and the villa provides a lot of space. The pool area and pool bar was fantastic and offered many lazy hours in the sun. The property provides a lot of privacy and is located in a quiet area. We will be back next year and we really recommend this stay to others. Take care Nick and Yvette and talk to you soon. Just wonderful. We just loved it. My wife and I usually stay in luxury hotels but after 15 years, we decided we wanted to be on our own for a while without the grownup children; with our own time-schedule and our own in-room dining, no butlers, no housekeepers and no turn-down service and no noisy guests next door. The house is very tastefully decorated and well appointed, with each guest room having en-suite bathrooms, perfect airconditioning and amenities, including a fully equipped utility room, it ticked all the boxes. The first week, before the kids flew down, it was "just the two of us". We enjoyed the peace, quiet and real privacy with lots of space to wonder around. We enjoyed the pool immensely and with 2 weeks of unbroken sunshine, it was bliss. Housekeepers came when summoned and the "concierge desk" was manned my a very able team at Bastion d' Azur and no other than the owner of the house, Nick who was always available on his mobile. Les Issambres is on the coast so all of the main amenaties and beaches are within a few minutes drive. For snow ski ing it is a 2 hr drive back towards Nice and then to Izola 2000. Golf courses in abundance and water parks at Saint Maxime and Frejus. A security deposit of 500 euros will be required at the beginning of your stay and will be returned in full upon final inspection. Deposit on booking the villa is 25% of the total agreed cost. Deposit non refundable Cancellation policy is 4-6 weeks 50% refundable; 2-4 weeks 25% refundable; less than 2 weeks no refund. Linen and house towels are provided however there is a linen cleaning charge of 30 euros [per person] and a one off villa cleaning charge of 250 euros both paid to the house manager on arrival. It is expected that all fridges, bins and rubbish collected is disposed of by the renter at one of the local roadside disposal points prior to leaving the property at the end of their stay. This is not the responsibility of the house manager.